Use your personal or small business chip card to make transactions at the same places you do today. For merchants who have chip-enabled terminals, insert your card and approve your purchase. Otherwise – swipe your card as you normally would. For use at ATMs, simply insert your card and follow the on-screen instructions. Remember to take your card when prompted. For your convenience, Highland Bank has partnered with MoneyPass® to expand our ATM surcharge-free Network. In addition to the surcharge-free ATMs at all of our Highland Bank locations, cardholders have access to thousands of ATMs nationwide. Just look for the MoneyPass® logo on the ATM or download the MoneyPass Locator App. 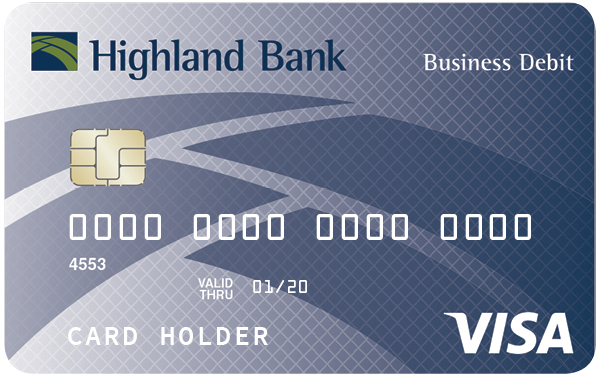 Highland Bank debit cardholders use CardValet to turn their card on and off anytime. Set locations where the card can be used and restrict transactions based on merchant type. Establish transaction limits and schedule alerts for certain transaction types. Our debit cards are equipped with EMV (Europay, MasterCard and Visa) technology used to authenticate chip-card transactions. The cards improve payment security, making it more difficult for fraudsters to successfully counterfeit cards. Most of all, it means greater protection against fraud. More terminals and ATMs are becoming chip-enabled throughout the U.S. You’ll also enjoy greater acceptance when traveling: Chip technology is common in over 130 countries around the world, including Canada, Mexico and the United Kingdom.